Oil Pastels Workstation by Jane Hughes is published by Price Stern Sloan in Los Angeles, ISBN 0-8431-3758. This volume is much more than a good beginner text -- although it is that, and I enjoyed Jane's concise, information-packed easy reading style. This book is actually a workstation in itself -- a kit containing everything you need to get started in oil pastels. Sixteen well chosen colors of student grade oil pastels are included in a plastic tray glued to the extended back cover. A clear styrene tray fits neatly over them to protect them and a window in the front cover displays them. It's glued on, so I taped mine shut and kept the cover after using them to keep all the pastels in place. There's also an eraser, similarly marked with "Workstation" as the brand. I can't identify the actual brand of oil pastels included but they're good student grade ones. Smooth, opaque, rather firm but still not as crumbly as some student brands, I enjoyed them. Also included are several pages each of white and dark green quality cartridge paper for drawing on. 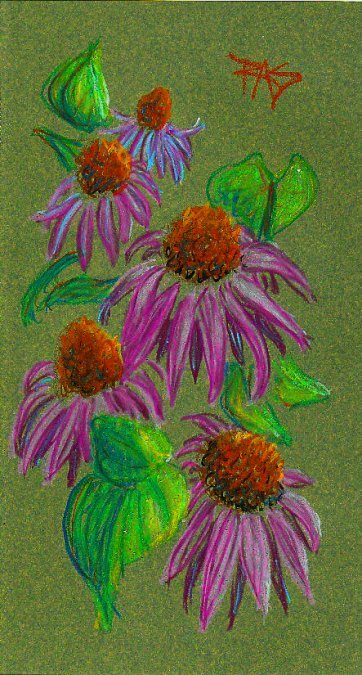 Below is an echinacea drawing I did using the Workstation pastels on the dark green sheet of cartridge paper. The paper is smooth and heavy. The color is darker and a little bluer in life on the dark green, this is as close as I could get the scan to match the value and hue without distorting the colors of the drawing. The pages are perforated for easy removal, or you can keep them in the book to use the Oil Pastels Workstation more like a sketchbook and draw on both sides. The tall narrow format is particularly handy for sketchbook style use, as you could either do tall subjects, wide panoramas or put two or three sketches on a page. The author, Jane Hughes, is a freelance illustrator whose works have appeared in magazines, advertising and books on packaging. Her commercial art background shows in many of her examples and the elegant format of the volume. I liked the variety of styles and techniques she demonstrated and the way she included design principles as well as accurate rendering. Most beginners want to be able to render subjects well enough to be recognized, whether they're interested in Impressionism, Realism or other styles what they seek is a way to draw things as they are. The Oil Pastels Workstation has enough to get someone who's a complete beginner to art started in the direction of representational drawing and painting, with an inexpensive medium and a wide range of techniques that give strong, glowing, colorful results. The concept of the Oil Pastels Workstation is brilliant as a gift item for someone in a hospital, a spouse tagging along on a business trip or as a gift for self to enjoy through a stay-at-home vacation. This is a good introduction to oil pastels and art in general in a compact, self-contained form. The hard covers also make this book-sketchbook-set function as a drawing board, so you really would not need to pack anything else along if you took it somewhere. Nothing in it would set off security problems at an airport either, it's well designed to put in a carry-on for a long plane trip. 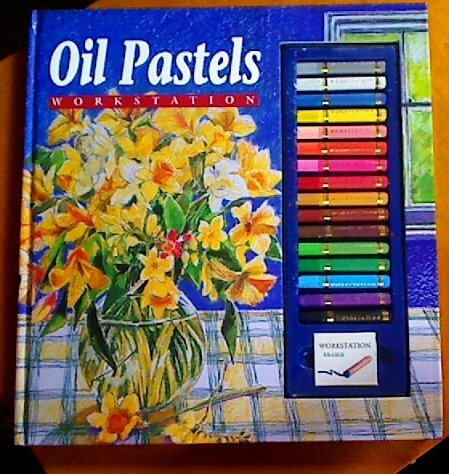 I found my copy of the Oil Pastels Workstation at Amazon and also found a number of inexpensive copies from resellers when I bought it in March 2009. Be sure to check if you're buying a used one for whether the pastels are unused, the copy I got had unused pastels and was still very cheap. All the demonstrations are done with the pastels in the set -- a fine point that I appreciate Jane Hughes for, as it's frustrating in kits to see demonstrations done in better materials or colors that aren't included. If you're advanced enough that there's nothing new in the book, it still may be a fun thing to pick up for a long trip as it does have many inspiring examples and some delightful Britishisms in the prose that didn't get eliminated when the publisher Americanized the spelling. I enjoyed this and will probably carry it with me when I go to appointments and so on where I need something handy and self contained.